As promised, Pixar has taken Cars 3 to the Detroit Auto Show being held the next two weeks in Michigan. Kicking off the event earlier today, John Lasseter took part in a press conference previewing the film and several of the characters that were announced recently. Those who were in attendance also had the chance to get a peek at previously unseen concept art as well as an exclusive clip from the film. Take a gander after the break! Our friends at Pixar Post covered the event extensively and shared some great details and images. Alongside Lasseter were Jay Ward (essentially the bigwig of the Cars franchise at Pixar) and Jay Shuster (production designer of the films). 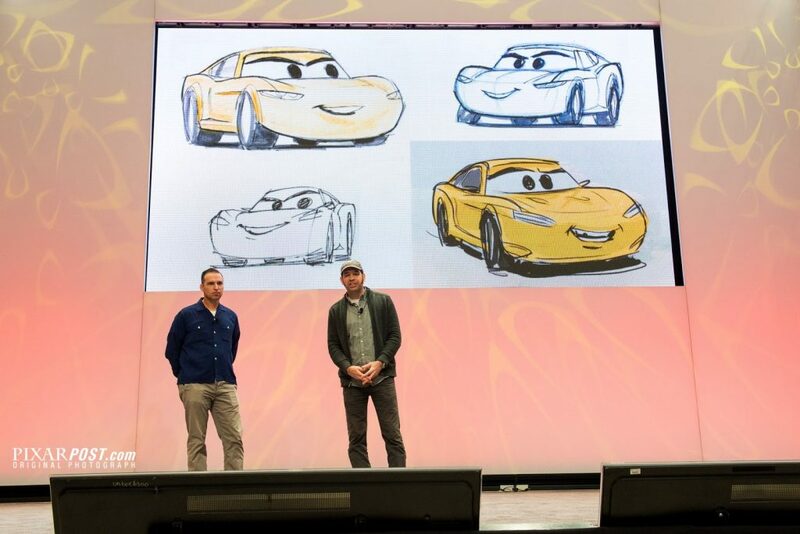 Together, they shared the inspiration for the Cars films, and provided some nuggets about what we can expect from the third entry in the franchise. Head over to Pixar Post recounting the event for many more photos and video from a portion of the show. The life-size Lightning McQueen which drove onto the event stage will be on display at the Detroit Auto Show, which runs through January 22nd. Cars 3 hits theaters on June 16th.